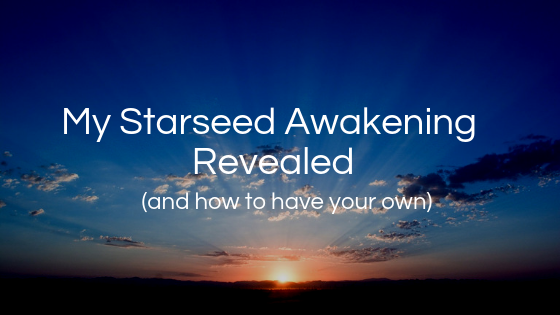 I'm going to be sharing with you my Starseed awakening showing you stuff that I've never shared before and also share with you how you can have yours as well. First off, maybe you've seen some of the videos that I've done recently on star seeds. I have done probably about five to eight videos now specifically on star seeds, and I'll be honest, the feedback from it has been incredible. I have been wanting to speak about this since 2011 or 12. However, I've had a YouTube channel since 2016, and I specifically waited a couple of years because I didn't want. I knew that it was something I had to really come to understand more, but at the same time I simply thought that it was just a little bit too out there for society in general and I had these also things about like how I wanted people to perceive me. I was like, well, if I start talking about that, maybe some people will think that I'm not as credible. I'll just stick in my little box of the Law of Attraction videos, which is what I did for a long time. However, I knew that eventually, I wanted to be sharing content like this and now that I'm bringing it out or you know, sharing my parts of it, how I think about it, the feedback has been incredible. I want to say thank you to everyone that's been watching. It's been a part of this journey and I want to go deeper. I want to share with you more about Starseeds understanding are multidimensional nature, understanding why we're all waking up right now. Because the thing is as a star seed, you are waking up more and more right now. Understand you wouldn't be here if you weren't a star. You're a Starseeds. That's why you're reading this blog because you can only perceive that which you are the vibration of and even at a greater level. Let's look at what it starts. You'd actually be a star. Seed is someone that is aware of their connection to the stars. The thing is, is every single one of us on the planet is a multidimensional being. We are multidimensional beings. We exist here right now, but we also exist at many different levels at the same time. In a way, you could say that every single person on the planet is a star seed or is the star seed because they're multidimensional. But what we could call star seats are people that are waking up now to who they are and their connection to the stars. Maybe feel more of a resonance with homes and other places in the star versus here. However, just know that everyone has existences at that level, but at a greater level, you're waking up now because your purpose, you had a mission to come here, to wake up first, to then wake up other people. It doesn't mean that you need to like, you know, tell him about this and say, you got to understand that you're multidimensional. It just means that by you being you, you bring through a light into this reality that influences everything because the thing is we knew that coming here it was going to be a little bit difficult because we were going to forget who we are. When we're born on earth, we forget who we are. There's a veil of forgetfulness. We go through and then we wake up here as babies. We go through social conditioning. We go through a lot of pain, and then we start to wake up to more of who we are. We may start off with this spiritual awakening, which is where we learn that we are immortal, spiritual beings, living a temporary human experience. We learned how to observe our thoughts, but then that can eventually lead us to a Starseed awakening where we recognize that we also have existences in different parts of the universe. Because think about it as well. You are a vast, great being spiritual being. You are not limited by time and space. You exist at many different levels. You would not just incarnate your energy in one planetary sphere and nowhere else because you're too vast. You can't do that. You would put part of you here. There are different levels as well. This is a three 40 level perception, reality, 5D, but you have six, seven, eight d. You have so many different levels of your own soul, so it's like you exist at many different levels at the same time. That was kind of wanted to share that before I even get into it, because you may be asking yourself, as I talk about this, you may think, oh his Starseed awakening is this way or that way. I wish I had mine. You're a star seed, so there's nothing, there's nothing to worry about. Here you are a Starseeds as well. My Starseed awakening, let me first off say that I've always felt different. This doesn't mean I always felt like I was better than everyone else. I've just always felt different. Even my mom told me that as I was growing up, as I would play with other kids, even like my cousins or my brother and my family members, I just always had this kind of energy about me to where I was totally okay with just doing my own thing. And she said that she could always feel like I felt different, I felt a little bit different. And she said that she could tell that I was a little bit different than the way I would interact with everyone else. I think a lot of it had to do with as well because I was, she said that when I was a kid I was also always observing other kids. Empathy to where they can kind of feel how other people felt. But she said, I get with my little brother who is three years younger than me, I could feel that if he needed something, a lot of times I would just kind of look at him, feel and then go do something and bring him something or, and have that kind of, that kind of relationship. Empathy, it's like an energy connection. We communicate that way. There's one; there's one situation that I, that I, I can, I was talking to my brother about when I was, how old was I? I was, I must've like seven years old. He was probably five years old or six. I was probably seven. I don't even think I was eight. I think I was about seven years old. I remember telling him that I, it wasn't me to necessarily messing with him, but I remember telling him and talking to them and saying, we're here right now. But we come from the stars. We come from the stars. Remember telling them that we are aliens. Like actually saying that because that's what, that was the term that we use, you know, that we would have used back, you know, this isn't the nineties late nineties or the nineties and I would, I would say, oh, we're from the stars. And I remember him thinking about it and he was like five and I was like seven. And I, I don't know why, cause I don't remember that many situations from my past, but I remember this very vividly. I remember sitting in my dad's room on this certain house that we lived in for a while when I was in probably second or third grade and he was probably in first or kindergarten or whatever. I remember just sitting there talking to him and being like, we come from the stars. We are aliens, but we think this is who we are. And at the time I probably felt like I was messing with him or something, but I knew deep down that that resonated. There was some level of truth in that. Now, oh, when we think of aliens for stuff, we always think of like grades and stuff doesn't have to be like that. I remember that very vividly as well. If you fast forward a little bit, those were two situations. If you fast forward to 2012 when I went to my spiritual awakening, I started to become aware of my thoughts and how they correlate with reality. I used to have ADHD and I used to need to take Adderall for that, which had harsh side effects of he couldn't eat very much, couldn't sleep very much. And I wanted to find out something alternative that would help me to get through that. I learned meditation. Meditation totally changed my life. I learned how to observe my thoughts. I learned how to let go of identity and labels thinking that, you know, I need it. I have ADHD, this is who I am. As I started to do that, I started to realize who I am not. I was like, I am not my thoughts. I am not this identity of like this rigid identity that I've come to understand. I realize that I'm so much more than that and everyone is. And then I was like, okay, since I know that this isn't who I am, well who am I? And I started to ask that question, who am I? Who am I? And I started to understand that I'm an immortal, spiritual being, live in a temporary human experience just like you are. You are any mortal, spiritual being, living a temporary human experience. And then what happened is I started to learn more and more about how reality works. I started to learn more and more about things online like different, that's when you start to eventually I started getting into understanding more about extra-terrestrials, understanding this connection that we all have, understanding that we are multidimensional beings, live in temporary human experiences. And I was open-minded to it. At first, I thought it was kind of weird, but I was open-minded to it. I started doing research on it and there were, I started learning about is very passionate about it. I thought it was just so cool. It really resonated with me. I remember I was going on a trip from grand can't or to Grand Canyon from Las Vegas with my dad, my two sisters. And I remember the hallway reading there. I was looking at my little iPhone because it was like one of the first generation iPhones. It's looking at my little iPhones and I was reading different articles from like I think it was like an old school date, like David Eick books or something like that. But there was something about it even though I don't necessarily believe everything that I, that I see with that there were certain things that did resonate and understanding that there are certain forces on the planet that caused us to think in a certain way, information is suppressed. That was another thing that came to understand. It opened me up to understanding that there's just more to reality than we'd been led to believe. Like, why don't they teach meditation in school? Why don't they teach a lot of this? Well, there's a reason for it because if you keep people in a certain state, they aren't as, as predicted there, there are more predictable that way and they don't, they don't outstretch their limits, you know, but we're, this is the time of the planet where we're meant to be waking up. I went on that trip and I remembered that opened me up also because there were certain temples we went to. In Grand Canyon there were these certain, I don't know what you would call it, but like Hopi, I think it was the Hopi tribe. There was this art, there's this artwork and you see in this artwork you seem like very obvious that they were referring to some type of a UFC is and aliens you could tell like undoubtedly. And when I went on that trip, I walked into a certain like little place where there was all this artwork that was like on the walls and stuff. And I felt this buzz of energy. It was like, Whoa, what, what is this? Do you know? And in that the paintings were of like ETS, say we're of like UFO shows and stuff like that. And what happened was, is that was an experience I had and it was like, hmm, I started to open me up more and more. And I remembered that a couple of days later I went back to Vegas, went back home and I just started studying all of this stuff more and more. And there's something about it that resonated with me. What eventually happened is I came across and I was reading something and I came across this, this word called Pleiadians. Pleiadians is a certain star system. The Pleiadians are an extra trace, your old race of light beans that's are here to help raise the frequency of the planet. And many, many, many, many, many people on the planet right now have connections to the Pleiades. But okay, at the time I just came across this word played. He's, the moment I came across this word, plea eighties, I started to get this buzz through my body. It's hard to explain. It was this feeling and it's knowing that there was some connection that I had to the plate. He's now, there are many different names I was looking at. It wasn't like I was just looking at one and I was like, oh, this is, this is, you know, it was like I saw art tour. I'd like, you know, the Arcturians Syrians, which I also felt a connection to. Pleiadians and Dramatudians, vegans, lions, all the, I mean there are so many different things, you know, words I could look at. But there this thing with Pleiadians where when I read the about Pleiadians, there's this buzz throughout my body and I just felt such a strong connection to it now that, and then, and then, oh, what happened was, is I started to go into meditation and I started to connect to this. I started to connect to this energy and I started to feel and just know, become very familiar with that energy. And from there, eventually, I found this symbol. It was this triangle symbol that is used to represent the Pleiades. And it just, it, when I saw it, one of the same things, I just got this buzz through my body. I just knew that there was some level of connection between this symbol that I saw that had this triangle type thing. And I said we're here to raise the frequency of the planet. And that is that like it was this purple. It was just something that resonated so deeply with me. I knew once again that there was some level of truth and everything that I was perceiving of in his reading because it was a vibrational thing. You know, a lot of times we'll ask, you may ask people, how do you know this stuff? How do you know this? How do you know this? It's something you can only experience by going within. It's something you go within four. You may ask yourself, what are you connected to? Well, you can set the intention to figure it out, set the attention in the dream state. I've had dreams as well that shows me this is who you are. This is, you know, it's not that that is who I am because I'm also here on earth having a human experience. But I have a parallel connection to this other version of me and there's a strong resonance because that version of me is helping me if that makes sense. There are many different levels of our own beingness. And the more we become aware of this, the more that we begin to tap into it. That was some I became aware of. There's a couple of other correlations as well that really just makes sense to me. For example, a lot of people don't know this is not, it is a big deal or anything, but I used to have a speech impediment and I couldn't say ours. I'm going to go to the racetrack, I wouldn't say ours. And I then eventually learned and heard something or looked at something that's called the language of light, which apparently is a certain type of vibrational language that in higher dimensions we may use now in higher dimensions, we normally use more. Tell empathy, it's much more efficient because telepathy you there, you can, you can learn 100 different things at once because it's more of a vibrational thing. However, there was something called the language of light that once I heard, once again, I got a buzz through my body. It's like wow. It's like there's, there's a lot of symbols or syllables or tonalities that don't use that are, that they don't use. That was something else that I noticed and that was the way that the Pleiadians, I understood they can, they connect me telepathically, but there was also this language of light that I felt very connected to. These are all little connections I'm sharing with you right now that just, I, I began to see and feel when I'd get this bus through my body. It's like I get a flash of all these different synchronicities that led to that. Another thing is growing up, I've always had this huge fascination with dolphins, with dolphins. I've always just loved the office, not my dad has in Miami Dolphin Fan cause he's from Florida. However, I'd never cared about football. I never cared about football. I was born on November 24th, which is Thanksgiving when I was born and the Dallas Cowboys were playing. I was supposed to be like, you know like they were playing as I was being born, the doctor and my dad and we're watching the game as I was being born. However, like I've never been passionate about football at all. However, I remember always being fascinated with dolphins and as I was growing up, like I'd get gifts with dolphins, like dolphin pictures. There's this guy named Weiland who has like these he has this like the pink dolphins and stuff on buildings in California and stuff. I got this huge book full of his artwork. I used to get like sculptures of dolphins, like the whole bunch of Dolphin stuff because I was fascinated. I love dolphins and I find out years later all growing up, never knew. I just loved dolphins. And then years later I find out that dolphins are actually, in a way, this might sound kind of different, but dolphins are inter-dimensional beans have a very high vibration that are here that are also bringing through a high frequency in the planning because we're 70% water and they're very, very highly intuitive. They're very highly spiritual. I know for sure that they have a strong connection to. But in general, that's another kind of sign this like star c type energy. Understanding this connection and understanding. We all have connections like this, but the more I become aware of all of this, the more I see that this is something that that is very in my face. Like it's something I very much resonate with and it's something that you can also resonate with the more that you become aware of it. Let me see if I left anything out. I've also always felt like, I'm sure that maybe you guys have felt this before, but I've always felt like the mission on the planet with something much bigger than whatever. I was used to working a sales commission job selling woman's shoes and I just knew that as this year there's something you're meant to be doing that's going to help a lot of people that are going to, you know, your, you're, that's not the mission. Your mission is this like this is you have a different mission and I've always felt like I had a big mission. This doesn't need to be an ego thing where I feel like I'm better than everyone else and I have a bigger mission than anyone else. I think you have a big mission and your big mission could be to bring through this energy. Understand by us as Starseeds, we're bringing through energy of the stars to help other people wake up to who they are. So this is a whole process and this is something that we're all going through at different levels. Some people faster than others. But now what can you do? I felt a connection to plea eighties I felt a connection to Sirius. I simply know that when I'm in bed at night, I'm awake. I wake up, add those as those higher versions of me. I may get certain symbols in my awake. You know, as I wake up in the morning that this is what you did in your dream state. But I know it's actually much more beyond that. Same for you. You just don't remember it. Cause we have available for gifts on this here, but we're meant to remember in this life because over the next 10 15 years, so much change is going to happen. It's going to be amazing to see. There's going to be some things that fall apart, some things that feel scary, but it's going to be so empowering because right now we're taking our power back as a planet. There was another little thing I remember too. I remember when I first went through this awakening, I became very aware of that and, and of what, you know, called the back government or people that have been controlling, you know, why is everything on the media negative and why is this information kept from us? We want to wake up, we want people to wake up. I felt like this strong drive to help with that. And I realized then that that's also the Pleiadians agenda, the Plebeians agenda, or to help us raise our frequency and the wake up out of this deep hypnosis. And I've always felt that connection. And another thing, I don't know if this is societal can, this is what I've been told. I've also talked to a couple of clairvoyant people independently who've said that I had a strong connection to play these. That's another reason, you know, that that was after I came to all these conclusions, but it wasn't like I was like, where am I from? And I had to go to like a clairvoyant person, but I remember once or twice going to a clairvoyant person that was, that knew about this kind of information and asking. And I remember kind of challenging them once because I wanted to see us, like, are you sure? Like ladies, you know, and they're like, yeah, this the Pleiades, you know, it's a strong connection. I'm like, okay. Do you know? But I've always really, I've always been kind of had a thing with snakes. Know a lot of people do because it's maybe societally conditioned in with like religion and stuff like that. But, there's a race of beans called the reptilians and the reptilians are a fourth dimensional, lower fourth-dimensional race and they have been influencing a lot of people in this reality to kind of bring out certain agendas and whatnot. They're not the most positive race in general, but there are positive reptilians. However, they're kind of like beans that have like very sneak like features. And it's funny though, I'm telling me there's nothing that's really that funny, but I've always had this thing with snakes and I've always kind of felt like deep down there's a reason that I had that kind of fear of snakes. And from what I understand in different realities, there is sometimes these button heads between certain races with the reptilians because of kind of their agenda versus like the agenda of the collective or, or whatnot. I've always felt a connection to that as well. All of these things I mentioned with you right now, I recommend you go within for it. The first step to you having more of these kinds of experiences is a combination of two things. One, understanding that you are multidimensional, you are a multidimensional being, having a temporary human experience. The more you realize that is the more that you allow experiences like this that come in and for you to see these synchronicities in your life. First off, know that every single person on this planet is multidimensional and that includes you and you can become more aware of it. By having that awareness, by feeling and understanding, you're not just your ego. Observe your thoughts, observe this Avatar that you're using this life because it's not just who you are. The more you observe it is, the more you start to create this gap where you can see who you really are and who you really are as much vaster than you can imagine. That's the first step. The second step is to set the intention, set the intention to find out more of a connection of who you are. To the stars. Understand it can be beyond any name that we have that you can find online because there are so many different races. But set the intention to connect in a dream state. That's the thing I think would be the easiest. Set the intention to connect in your dream state, to remember some of it in the morning. Set the connection to get signs of it so that when you see the word or you come across it, you'll just simply know, set the intention and, and don't be attached to how it comes. Maybe it comes in some different way. Maybe it comes in a book, maybe it comes in some type of little visual flash you get or some type of an idea or thought or word. Just know that that's the seed has been planted and then be open to how it comes. But the first step is knowing that you are multidimensional and be open to what comes up. That's my star seed story. Let me know what you guys thought of it. I thought I'd just come out here and vulnerable kind of talk about you know, the different parts of my own life. Let me know what you think. If you want a guided meditation that will help you to raise your vibrational set point, that may help you as well become more aware of who you are.